Since your driveway takes up such a large part of your front yard, it is the first thing that visitors will notice. While it may seem like a minor detail, even the most gorgeous landscaping jobs will fail to reach their full potential when they surround a cracked, deteriorated driveway. To make the front of your home truly complete and maximize curb appeal, a welcoming and maintained entryway is crucial. At Topaz Design Group, we create customized, sophisticated stone and paver driveways that will immediately generate positive first impressions from each and every visitor. 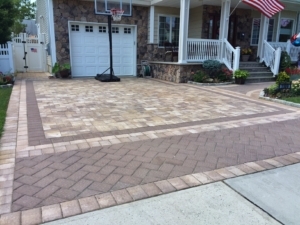 In the business for many years, our team knows which driveways are most durable and aesthetically pleasing. Whether you would like a full driveway or a customized apron entryway, our service leaves you with a lavish, durable driveway that is both efficient and beautiful. From Belgian block to paver stone, we work with you to select a material that will harmoniously blend with your home’s style and fit within your budget. With all of the space that a driveway encompasses, it only makes sense to maximize its appearance and durability. And best of all, a customized driveway can significantly increase your property value should you ever choose to sell. An alluring driveway can make all of the difference for your curb appeal. To share your vision and begin your driveway design project, complete our online form today.